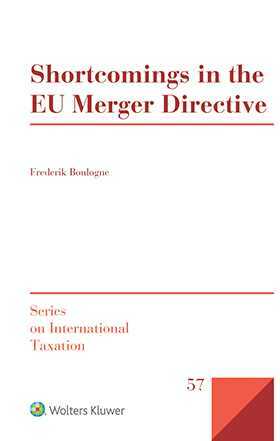 The book, Shortcomings in the EU Merger Directive, offers solutions for dealing with issues arising out of the shortcomings in the European Union (EU) Merger Directive (adopted in 1990 with the aim of eliminating the tax obstacles to cross-border restructuring operations, while simultaneously safeguarding the financial interests of EU Member States). In spite of the amendments and the European Court of Justice’s (ECJ) interpretations of its provisions, various shortcomings remain. Most of these pitfalls exist where the Directive conflicts with higher (EU) law (the fundamental freedoms and the general principles of EU law). Now, more than twenty years later, there is a heightened interest in tax harmonisation, while drawing reference from the ECJ's significantly developed case-law in the field of direct taxation and learning from the issues that have emerged with the implementation of the Directive in the Member States. The main objective of this book is to provide a thorough analysis of the Merger’s drawbacks – being broader and deeper than any prior work on the subject – addressing all the Directive’s subtopics methodically, following the paragraphs of Articles 1–15 in their logical succession. The author analyses the points in which the Merger Directive falls short of attaining its stated objective, and he also examines how these shortcomings could be scaled. To do so, he tests the Merger Directive against its own objective – primary EU law (the fundamental freedoms and the unwritten general principles of EU law) and non-discrimination provisions in relevant treaties. Which entities have access to the Merger Directive and which entities should have access to it? Which operations are covered by the Merger Directive and which operations should be covered? Which tax disadvantages to cross-border restructuring operations does the Merger Directive aim to remove, which tax disadvantages have been actually removed, which tax disadvantages remain, and how should the Merger Directive be amended to remove the remaining tax disadvantages? How tax avoidance should be combated under Article 15(1)(a) of the Merger Directive, which possible types of tax avoidance can be identified, and how the Merger Directive should be amended? Which cases of double taxation does a taxpayer engaging in cross-border restructuring operations potentially encounter, and how can they be taken away by the Merger Directive? The key shortcomings that are identified are: the Merger Directive’s objective is not stated precisely; minimum harmonisation does not lead to a common tax system; exhaustive lists are used as legislative techniques; the Merger Directive does not add much to the outcomes reached through negative harmonisation; and the definitions of qualifying operations are not fully aligned with corporate law. The book is structured along five themes, including an additional chapter on the suggestions of the amendments. In Chapter 1 the scope ratione personae of the Directive is examined. In Chapter 2 the scoperatione materiae of the Directive is discussed. Chapter 3 focuses on the granting of the Directive’s benefits. Chapter 4 covers the anti-abuse provision in the Directive. Chapter 5 looks at miscellaneous issues, such as the impact of restructuring on group taxation regimes, the consequences of restructuring on the avoidance of double taxation, and the possibility to expand the Directive to other taxes than (personal) income taxes. Finally, Chapter 6 contains a deeply informed and viable proposal for the amendment of the Merger Directive. CHAPTER 1 The Scope Ratione Personae. CHAPTER 2 The Scope Ratione Materiae. CHAPTER 3 Carry-Over of Balance-Sheet Values, Provisions, Reserves and Losses. CHAPTER 4 The Combat of Tax Avoidance under the Merger Directive. CHAPTER 5 The Avoidance of Double Taxation under the Merger Directive. CHAPTER 6 Proposal for the Amendment of the Merger Directive. Table of Treaties, Regulation, Directives and Communication. Opinions of the European Economic and Social Committee.